Industrial metals are on the recovery path. Let's see how they will move in the next few months. Base metals have been dancing to the tune of global forces. Under pressure in the first six months of the year - when aluminium, nickel, lead, zinc and copper fell 7% on an average - they staged a sharp rebound in July after data from the US and China showed economic recovery and raised hope that demand for these industrial metals will bounce back. The metals rose 15% on an average between July 1 and August 31 on the Multi-Commodity Exchange or MCX, India's biggest commodity exchange. The 23% rupee fall since the start of the year has provided extra support to prices. On September 3, the rupee was at Rs 66.88 to a dollar as against Rs 54.33 on April 1. "Rupee weakness, declining inventories on the London Metal Exchange (LME) and Shanghai, recovering US housing market and positive cues from China and Europe underpinned the rally," says Tarun Satsangi, head, commodity and currency research, Globe Commodities. Priyanka Jhaveri, senior research analyst, Kotak Commodity Services, says, "The industrial metals complex has been witnessing sharp gains in the past few sessions due to improving global economy and strong fundamentals. Stocks of most of these metals have been falling at exchange warehouses." We talk to market experts to gauge how the market is likely to play out in the next few months. Between July 1 and August 31, aluminium rose 14% to Rs 118 per kg on the MCX. "Global prices were near production cost after the fall early this year. After positive developments on the global front, investors found value in the metal. Recovery in China and the US supported the sentiment," says Kunal Shah, head, commodity research, Nirmal Bang Commodities. Rupee fall, declining inventories, recovering US housing market and positive cues from China and Europe have underpinned the recent rally. Experts say India has excess aluminium. Though the demand in India has been growing at a steady rate of 7-8% a year, low production cost because of availability of captive bauxite usually ensures that production is higher than demand. According to the MCX, in 2012, the world's primary aluminium production was 40.97 million tonnes (mt), up from 39.93 mt in 2011. Demand was 48 mt compared with 44 mt in 2011. More supply is expected from China in the second half of 2013 as it plans to increase production by three million tonnes to 30 million tonnes. In India, local factors are also at work. "There has been a crackdown on hoarders. Supply is expected to improve on account of pressure by the regulators. We feel aluminium has limited scope to outperform other risky assets. We expect prices to remain at $1,920-1950 per tonne on the LME and Rs 110-112 per kg on the MCX until December 2013." After a disappointing 2012, nickel continued to fall in the first few months of 2013. It hit a fouryear low of $13,205 in global markets in June. In India, it fell 13% to Rs 816 per kg between January 1 and June 29. However, global factors pushed up prices by 12% to Rs 915 per kg in July-August. The market sentiment is bearish due to prediction about surplus production. According to the International Nickel Study Group, the global nickel market had a surplus of 97,000 mt at the end of 2012. This year, the figure is likely to be 90,000 mt. 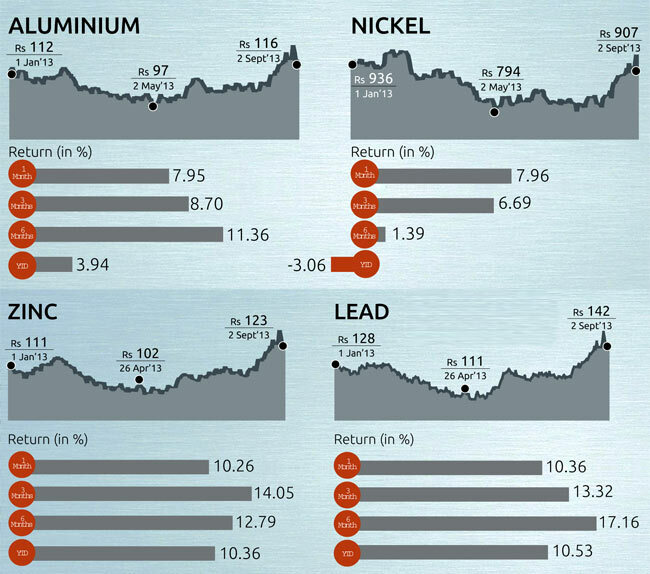 "Nickel has recovered smartly on the MCX, thanks to rupee fall and sharp pullback on the LME. If the price stays above Rs 950 per kg, it could touch Rs 985-1,015. 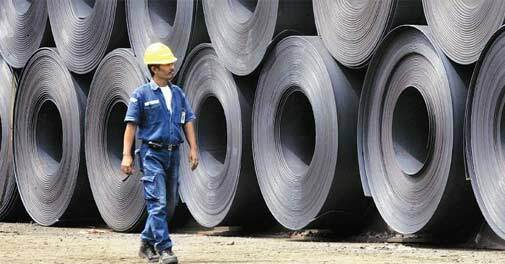 However, a fall below Rs 880 per kg could reverse the trend," says Navneet Damani, assistant vice president, research, base metals, Motilal Oswal Commodities. The metal is primarily used to make lead-acid storage batteries. Slowing demand for automobiles globally, which lowered battery demand, pushed down prices by 4% in the first half of the year. However, there was an 18% rise to Rs 143.80 per kg in July-August. Experts expect the trend to continue. 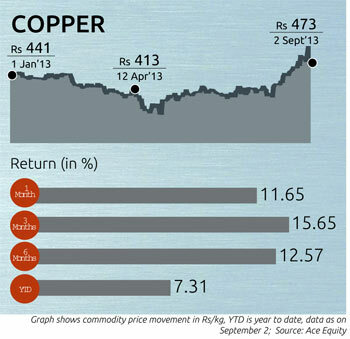 In the domestic market, continued rupee decline may push copper prices above Rs 500 per kg by the end of 2013. "After September, global manufacturing should revive in developed and emerging markets and push up prices. Chinese mid-autumn festival should also support demand for autos and electric bikes or e-bikes. In 2013, Chinese e-bike sales might surpass six million, which should be a positive for the metal. Investors are recommended to initiate long positions on dips looking at gains by the end of the year," says Sushil Kumar Sinha, business head, commodity, Karvy Comtrade. Damani of Motilal Oswal Commodities seconds Sushil Kumar, "Lead is expected to do well in the second half of 2013 as sales of car batteries pick up due to seasonal demand. Also, supply growth looks tepid. If prices remain above Rs 142 per kg, they can touch Rs 150 per kg. However, any fall below Rs 135 per kg may reverse the trend." Data from the International Lead and Zinc Study Group show that while global refined lead metal production has risen 5.8% in 2013, the demand is up 8.2%. The metal is used as a galvanising agent to protect iron and steel from corrosion. The primary users are construction, automotive, electrical and machinery industries. Zinc prices were also under pressure in the first half of the year. They fell 2.5% to Rs 108.80 per kg during the period, mainly due to slowdown in China and the possibility of tapering of stimulus by the US central bank. According to the International Lead and Zinc Study Group, the global refined zinc surplus in the first five months of the year was 38,000 tonnes. "However, the surplus has been 66 Money Today » October 2013 narrowing over the years. For instance, in the first five months of 2012, it was 1,52,000 tonnes," says Praveen Singh, senior research analyst, commodities and currencies, Sharekhan Commodities. However, from June, prices surged over 15% and were Rs 125 per kg on August 31 as against Rs 108 per kg on July 1. Experts are bullish on the future due to expectation of high demand. CARE Research expects domestic demand to rise at a compounded annual growth rate of 7.2% between 2011-12 and 2015-16. Sugandha Sachdeva, AVP and incharge, metals, energy and currency research, Religare Broking, says, "Indian zinc production has been increasing at a considerable rate. Production in India stood at 7.43 lakh tonnes in 2010-11, 22% more than in the previous year. Demand is seen at six lakh tonnes in 2012-13 and 8.8 lakh tonnes in 2016-17." "Prices are expected to surge towards Rs 130 per kg on the MCX by December. However, if the rupee continues to fall and prices breach the key level of Rs 130 per kg on a monthly closing basis, they may head towards Rs 142 per kg," she says. More than half the copper produced in the world is used to make electric wires. Prices have of late risen sharply in both domestic and international markets. The rise on the LME was over 7% between May and August. On the MCX, it was more sharp (27%), from Rs 281 per kg on May 1 to Rs 484 per kg on August 30. On the macroeconomic front, prices have got support from hope of robust demand in view of improving health of the global economy. Sentiments have surged on the back of positive signals, especially purchasing manager index (PMI) and industrial production data from China, which are pointing at economic stability in the world's top consumer of the metal. Data from the euro zone is also showing economic recovery. In the US, too, most economic data have been pointing to faster growth. "On the fundamental front, copper prices are seeking support from decline in stockpiles at the LME, the Shanghai Futures Exchange and COMEX warehouses. In the domestic market, sharp weakness in rupee against dollar has lent further support to prices," says Priyanka Jhaveri, senior research analyst, Kotak Commodity Services. "In India, rupee fall may push prices above Rs 500 per kg by the end of 2013," she says.